($2,150 Value ) See Appendix for Full Details. "Brilliant David and Diane will help you to not just make money building your business, but more importantly, you'll learn to do it in a way that creates true freedom. Read this book "
"David and Diane have done it again They share the practical secrets that anyone can follow to build both a successful business and a successful life." "We never dreamed that we'd be able to quit our jobs as Los Angeles police officers and successfully start up our own businesses, let alone succeed on the level we have. The ideas in this book worked for us, and they will work for you. We now get to wake up every day living our dream life "
"If you are ready to take your business to the next level, then this book is a must-read "
"The concepts and strategies I learned from David and Diane gave me that final ingredient I needed to strengthen my business and successfully sell it for a big profit. This book is a must-read for any business owner who wants to build a truly passive business and learn the skills to grow their wealth." --Blake Mitchell, Maui Millionaire and commercial real estate investor and syndicator. David Finkel is an ex-Olympic level athlete turned serial entrepreneur. He is the Wall Street Journal and Business Week best- selling author of 10 business and financial books, including the wildly successful Build a Business Not a Job, and co-authoring and Scale: 7 Proven Principles to Grow Your Business and Get Your Life Back. David is the founder and CEO of Maui Mastermind(R), a business coaching company who helps businesses in the $1-20 million range build their companies to sell, scale, or own passively. 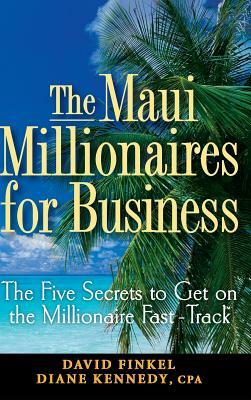 Over the past 20 years, David and the other Maui coaches have personally started, scaled, and sold over $2 billion of businesses. Maui Mastermind helps business owners build companies they love owning again--for the value they create, the lives they touch, the profits they earn, the team they employ, and the freedom they enjoy. To learn more about working with his company to get the structured business coaching you need to take your company to the next level, visit them on the web at www.MauiMastermind.com. David's weekly business owner e-letter is read by 100,000 business owners around the world and his business articles have been featured in over 6,000 newspapers. He and his wife Heather, and their three young sons live a very simple life in Jackson Hole, Wyoming.